Boo! 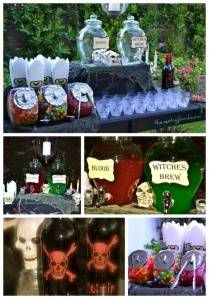 Are you DYING to have a Halloween Party? Then check-out my Spooktacular Dinner Party……if you dare…mwwwahahahaha! Candy & Libations bar was a monstrous success! No TRICK JUST TREATS: For candy holders buy bulk take-out containers, and add spooky stickers. I chose BATS. Then fill some jars with tempting treats. 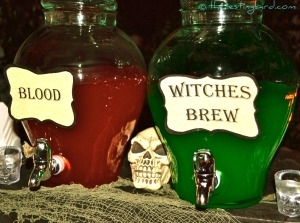 For the Boo-tiful Bar, Spiked Fruit Punch for “Blood” and Margarita’s for “Witches Brew” served in Skull Glasses (found at your local party store). Specimen Jars are easy & FUN to make: just fill a mason jar with a small unusual find (cheap plastic toys work great) add water, food coloring (I chose Ghoulish Green) and....BOO! A CREEPY craft is created! FOOD FOR THOUGHT: Brain Jello Mold & Spaghetti for Worms = an eye popping centerpiece. The Mold can be found at party stores (red Jello, of course) then I used GREEN & RED food coloring on my spaghetti "worms"
For the sit down dinner we served lot’s of FINGER foods! Shaped like FINGERS, get it! Candelabras covered in cobwebs with skulls adorning the dinner table, helped create a devilishly divine dinner scape.